Enesi’s primary focus is on the development of solid dose vaccine products. The company has shown that its ImplaVax® technology can lead to the formation of highly efficacious and stable vaccines which, combined with its delivery device, offers significant benefits to stakeholders including safety, ease of administration and the reduction or even abolition of cold chains during distribution. Enesi has exemplified the potential value of the ImplaVax® technology for vaccination by completing successful studies in several infectious diseases, including seasonal influenza, diphtheria and anthrax. 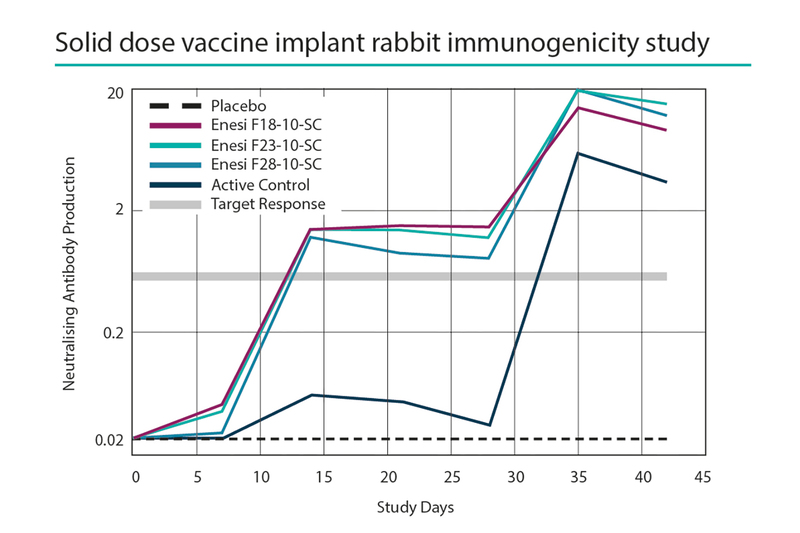 Potential dose-sparing was noted in the all studies, with enhanced immune response seen compared to commercial vaccines, producing potentially protective antibody responses after a single dose of the ImplaVax® vaccine. Enesi has entered into a number of collaborations to evaluate opportunities for ImplaVax®-enabled vaccines including vectors, DNA, recombinant Protective Antigen (rPA) and emergent threat Pathogens candidates.